'Twas late last night that I found myself dabbling in fiction once again writing away a weird and mystifying tale when I realized I had chosen a previous Cryo Chamber collection as my source of inspiration. That title was Cthulu and it was only after I had put down my pen and laid in bed that I realized I had not listened nor mentioned a dark ambient album in quite some time on my precious little website. So off I went to Cryo Chamber's Bandcamp in search of a piece that would quell my inner hunger for something dark and sinister, yet meditative and placid all the same. Lo and behold I stumbled upon another massive collection of talents and another entry in Cryo Chamber's H.P. Lovecraft tributes titled Nyarlathotep. This massive undertaking was presented by twenty-five different musicians who are all listed on the Bandcamp page, but for those dark ambient enthusiasts who wish to know who they are here and now I have listed them before you: Kammarheit, God Body Disconnect, Dronny darko, Ugasanie, Kristoffer Oustad, Alphaxone, Svartsinn, SiJ, Gydja, Atrium Carceri, Darkrad, Flowers for Bodysnatchers, Aegri Somnia, Randal Collier-Ford, Neizvestija, Metatron Omega, ProtoU, Northumbria, Sjellos, Sabled Sun, Council of Nine, Cryobiosis, Apocryphos, Enmarta, and Mystified. The title of the collaboration does refer to H.P. Lovecraft's creation of the same name, Nyarlathotep. In the Cthulu mythos, Nyarlathotep is a malign deity who is responsible for many collapses and horrible wrong-doings in Lovecraft's fictions. While I shall not spoil any major stories Nyarlathotep occupies, I can direct any reader to the original poem Nyarlathotep, Lovecraft's short works The Dream Quest of Unknown Kadath, the re-telling of the original poem Fungi from Yuggoth, The Dreams in the Witch House, as well as The Haunter of the Dark. There is also a book titled The Nyarlathotep Cycle which is a Cthulu mythos anthology which collects both Lovecraft's original works on Nyarlathotep as well as other author's works either inspired or referencing Nyarlathotep. For all avid readers, I suggest you go ahead and take a gander at these works. The collaboration is split into three segments lasting nearly or over an hour in length for a total of one-hundred and ninety minutes of dark ambient bliss. In the first movement, heavy themes of ancient Egyptian tones and bleak summons dominate the beginning twenty minutes. As the piece moves onward, the clicking and scattering noise of beings and creatures more powerful than man itself become present. Sweeping rays of dark drone atmospheres and unnatural winds are brought forth as static and what some would refer to as binaural beats took over my brain. If the first act of Nyarlathotep acted as a summoning ritual that brought forth the might of this divine entity, then I imagine the second movement was inspired by the destruction it can bring. The tone of this second movement shifts away from pure bewilderment and wonder to extreme anguish. The fields of atmospheric noise are reduced to barren wastes that sometimes trickle with mental invasion. After all, Nyarlathotep is capable of making man unaware of their surroundings, and this is exactly what this movement sounds like it was inspired by - the loss of feeling and steady ground. The last movement of Nyarlathotep seems to be the aftermath of the deity's reign on Earth. The last piece was silent and barren, but this one is dismal and downright depressing. Deep far off echoes reminisce failing and collapsing societies while the rigid blasts of noise walls and whispers showcase the psychotic meltdown of the modern day world. Now, everything that I have stated in this review is all up for interpretation. What you take from Nyarlathotep could be completely different from what I saw in the music as it very well should. 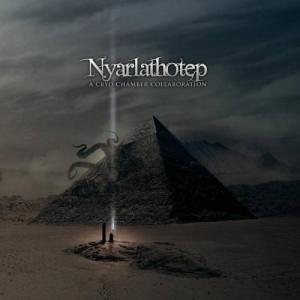 Even if we do have different opinions on the story that is formulated in this piece, I do believe there is one thing we can all agree upon: Nyarlathotep is an amazing work encompassing the drone, dark ambient, and spiritual fields. This gigantic collaborations are my favorite from Cryo Chamber, and I'm glad to have discovered another piece that will aid me when I'm wishing for meditative music. Congrats to all who were involved in this piece. It is stellar.